A review of Gita Viswanath’s book on Indian military literature and Hindi war cinema. 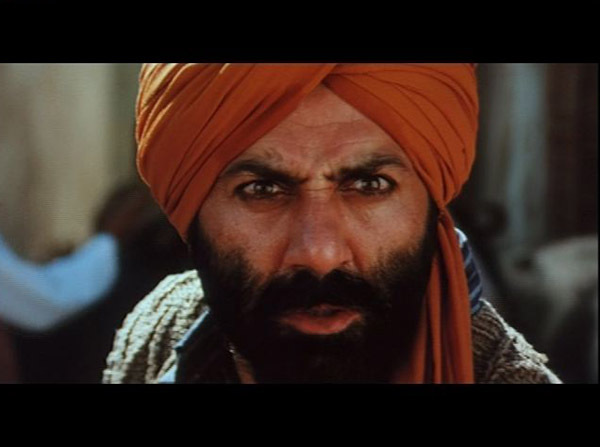 Sunny Deol from the movie Gadar (2001). 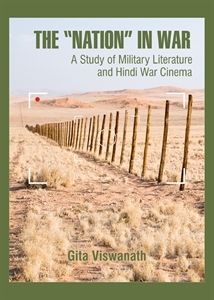 Gita Viswanath, in her recent book The “Nation” in War: A Study of Military Literature and Hindi War Cinema, states at the outset, “This study seeks to examine the notions of nation and nationalism in war narratives”, and the book does offer an interesting catalogue of such narratives in the Indian context. Such an endeavour is important given that analyses of war in India, and indeed the Subcontinent, tend to focus mostly on military tactics and/or regimental histories as well as policy imperatives from a strategic international relations perspective. Following the 1999 Kargil War there have been some works on the impact of the media on perceptions of the nation at war. Viswanath’s book is unique in its focus on war memoirs and war films and the ways in which they engender the nation. The chapter on war memoirs is potentially the most valuable, both in terms of highlighting texts that may not be well-known outside specialist circles as well as in the insights they offer. In the chapter ‘The Uniform(ed) Self: A Study of Military Literature’, Viswanath looks at a wide range of memorialisations: the edited version of Amar Singh’s Diary of his participation in the Boxer Rebellion, Captain Lakshmi Sahgal’s A Revolutionary Life: Memoirs of a Political Activist, Brigadier J P Dalvi’s Himalayan Blunder:The Curtain-Raiser to the Sino-Indian War of 1962, Major General Lachhman Singh’s The Indian Sword Strikes in East Pakistan, Lieutenant General S K Sinha’s A Soldier Recalls, and Harinder Baweja’s A Soldier’s Diary: Kargil, The Inside Story. Viswanath foregrounds Amar Singh’s liminality – a Rajput royal with a King’s Commission fighting an imperial war against the Chinese – as well as Singh’s awareness of racial distinctions within the British Army. She also rightly points to the ways in which the romance of battle, imbricated as it was with Rajput warrior identities and notions of valour, plays itself out in the narrative recollections. In her analysis of Captain Sahgal’s experiences in the Rani of Jhansi Regiment of the Indian National Army (INA), Viswanath highlights the manner in which women were simultaneous sites of modernity and tradition, and how Sahgal negotiated these boundaries. The Rani of Jhansi Regiment was an all-women regiment of the INA raised in July 1943. It consisted primarily of women based in Singapore and the regiment was active till 1945. Saghal played a major role in the establishment of the regiment believing “that this unique venture would also have far reaching socio-economic consequences and lead to the empowerment of women.” Viswanath notes that the women were not assigned combat roles and signed a petition in blood to Subhas Chandra Bose, which read: “Why are we being treated thus? You gave us the name of the valiant Rani of Jhansi … you assured us that we would fight in the thick of the battle like the Rani, that our presence in the armed forces would demoralize our enemies”. The desire for battle is interesting in that combat is seen as an equaliser; here, women can insert themselves into predominantly male narratives but only through participation in combat. What is also highlighted is the marginalisation of women in narratives and memories of war as those “who had served in the INA went back to their homes and the dream of social empowerment remained unfulfilled”. While this is in general true, Captain Saghal is an exemplar of the manner in which women entered the public domain – as a member of the Rajya Sabha, organising aid for refugees from East Bengal in 1971, or working toward peace in the wake of the 1984 anti-Sikh riots. Sahgal’s service in the INA took on a legendary hue and she remained a public figure throughout her life. The “Nation” in War: A Study of Military Literature and Hindi War Cinema by Gita Viswanath. Cambridge Scholars Publishing, 2014. In her attempt to deal with a wide variety of texts, Viswanath often offers summaries and scattered analyses rather than a more sustained and coherent interpretation of the specificities of war texts or the implications of those narratives in different contexts. When she does analyse texts carefully, as in her close reading of the newspaper coverage of the 1971 war, she is insightful and delves into the manner in which the Indian print media aided “the mobilization of sentiment” at the time. However, when she speculates on the influence of media coverage on ‘anti-war sentiment’ during the Vietnam War, she repeats cliches: “The coverage helped to generate anti-war sentiment to the extent that it had an impact on policy decisions. Years after Vietnam, the US realised that one of the main reasons for losing the war was its inability to control the media.” This is commonplace in revisionist and conservative histories of the Vietnam War and has been disputed by critics such as H Bruce Franklin and Noam Chomsky among others. They highlight the fact that at no point in its coverage of Vietnam did mainstream media question the fundamental assumptions of US involvement nor did it sufficiently undermine the necessity of the war. While it is true that images of war and violence were available on TV and in mainstream print media such as Time and Life, those did not affect policy decisions in any significant manner. For example, President Nixon’s ‘Vietnamisation’ policy, which involved the gradual withdrawal of US forces, was accompanied by intense bombing not just of North Vietnam but also of Cambodia and Laos – this despite media coverage. Combat is seen as an equaliser; here, women can insert themselves into predominantly male narratives but only through participation in combat. Another example of somewhat lazy analysis is her comparison between representations of war in Hindi films and Hollywood ones. “In contrast [to Hindi films], the Hollywood war films, especially the Vietnam films (Platoon, Saving Private Ryan, Apocalypse Now) are strong indictments of the business of war.” Apart from the factual error in the list – Saving Private Ryan is a World War II film – there are analytical problems in that none of these films are “strong indictments of the business of war”. Platoon, to take one example, is a solipsistic representation of American involvement offering no critical insights into the reasons for the war. Ruminating on his experience as he leaves Vietnam, the hero Chris Taylor avers that “We did not fight the enemy,we fought ourselves and the enemy was within us.” As with the myth that critical media coverage led to America losing in Vietnam, Taylor’s statement is also a commonplace amongst revisionist historians who argue that it was the anti-war media, protestors, and the Congress that were responsible for defeat, i.e. the enemy was within. To acknowledge that a bunch of Third World revolutionaries had defeated the most powerful nation would be to go against America’s imagining of itself as a force for moral good in the world. At best, Hollywood films offer limited critiques of war which Bollywood films generally do not. The comparison between the two is fraught because while there is a genre of war films produced in Hollywood along with a military-entertainment complex that sustains the productions, there doesn’t seem to be such an interface in the popular Hindi film. Arguably, Viswanath’s study is not about Vietnam but about Hindi films. But since she offers the contrast, it seems necessary to work it out analytically, to point to the ideological complicity of Hollywood representations of Vietnam rather than claim that they are “strong indictments of the business of war”. The trope of motherhood used for the nation is full of paradoxes. […] On the one hand, the nation in the form of earth mother produces warrior sons, and on the other is incapable of protecting herself from the enemy, for which she needs to harness the services of her progeny. Viswanath argues that inherent in military training and service is the notion of a ‘flight from the feminine’ and that the nation can only be defended by its men (the feminisation of the nation underlies this construction of valiant defence). While Viswanath is entirely right about both the subservience of the family to the nation and the army as well as the feminisation of the nation and its helpless citizenry, she seems to ignore instances of cooption as well as direct participation of women in war which complicate the male-female binary. For example, Gold Star Wives and American Gold Star Mothers during the Vietnam era were paraded by the Nixon administration as exemplars of heroic feminine patriotism (as opposed to the un-heroic women at home protesting for their rights as women and citizens). To state that “writing and reading are completely private activities” is to diminish the ways in which writing and reading are also political acts which participate significantly in the construction of national imaginaries. The relationship of women and war is something Viswanath rightfully stresses as worthy of study: “Women’s agency in the third world context needs to be treated within more sophisticated theoretical matrices. My analysis of nation and war as gendered categories seeks to develop an understanding of the problematic relationship between women, militarism and the state.” This is entirely necessary and references to studies by Jean Bethke Elshtain, Nira Yuval-Davis, Miriam Cooke and Angela Woollacott are available in the book. Viswanath states that “narratives of the Vietnam War in which ten thousand women served continue to confine women to sexual and domestic spaces”. Kathryn Marshall in her book In the Combat Zone: An Oral History of American Women in Vietnam, 1966-75 estimates that between 33,000 to 58,000 women served in Vietnam, and while domesticity and sexualisation were definitive of war and post-war experiences, accounts by women such as Lynda van Devanter do rupture these dominant narratives. “Women’s agency in third world context[s]” has been analysed with theoretical sophistication whether it is Veena Das’s study of the 1984 anti-Sikh riots or Karen Gottschang Turner with Phan Thanh Hao in Even the Women Must Fight in the context of Vietnam. Viswanath cites Elshtain on the invisibility of women in war narratives: “Because women are exterior to war, men interior, men have long been the great war-story tellers, legitimated in the role because they have ‘been there’ or because they have greater entrée into ‘what it must be like.’” While this is generally valid, there are narratives of war by women since at least World War I and increasing numbers of women now participate in war machines the world over. Crucially, women have written and spoken about war from points of trauma, protest and resistance. Viswanath’s framework of military literature in terms of ‘insider’ and ‘outsider’ representations based on whether one belongs to the military or not mirrors the ‘exterior’/‘interior’ dichotomy drawn by Elshtain. Although she acknowledges this distinction as ‘specious’, her analysis does little to dismantle the binaries or to consider wider contexts of women writing about war and its aftermath. This is a pity since Captain Lakshmi Sahgal’s account offers much by way of interrupting dominant male narratives of war and nationhood. While Viswanath is conscious of the gendered rationality of the nation and war, she seems to focus more on the ways in which militarisation and masculinity intersect at a historical juncture in India. “It is this popularization of the military man as the national hero through cultural artefacts that makes the nineties an apt choice for the periodization of this study.” The increased visibility of militarisation in the 1990s along with a muscular foreign policy vis-a-vis India’s neighbours was best illustrated in the 1998 nuclear tests. This visibility can be attributed partly to the growth in television whereby conflicts such as Kargil could be covered in real time. However, military interventions and the militarisation of societies such as in Kashmir and the Northeast date back to 1947 and do not construct the military man as national hero, except in the most statist sense. What is also notable about these theatres of war is that they do not receive the kind of media coverage that Kargil, for instance, received. The specific examples highlighted above are indicative of a broader problem in the ways in which this study is theorised. There is a sense of the study flitting from one text to another without pausing to consider the intricacies of any. For instance, the chapter ‘Nation and Nationalism: An Overview’ offers a survey of standard literature on the subject ranging from Ernest Renan, Homi Bhabha and Eric Hobsbawm to Shahid Amin, Frantz Fanon and Benedict Anderson. Such a survey, while useful for beginners, is marred by observations such as: “It [the nation] is defined by combining subjective elements like will and imagination and objective elements like language, territory, race, and so on.” Precisely what makes “language, territory, race” ‘objective’ is not explained neither is the fact that these categories are as structured and fictional as the “will and imagination” dwelt upon. A little later Viswanath writes, “The historical construction of identity in India has traditionally conflated Hindu and Indian identities.” This seems to be an inaccurate conflation at best raising obvious questions: whose tradition? Whose and which historical constructions? Are these applicable across all identities and across historical time? The eliding of complex categories and questions is evident in the narrative: “In the nineteenth century, Hinduism was threatened by the missionaries who undertook large-scale conversions among the tribal and other lower-caste communities.” Again, quite obviously, many tribal communities were not Hindus in any sense of the term except within a political configuration that constructs them as such and wishes to bring them back into, as it were, a mythical fold. One final example: “It [state] is universal in the sense that every person on earth belongs to one state or the other.” In a commonsensical way this is true, but it does not take into count stateless or displaced peoples or peoples such as the Palestinians who may have a state but who find it diminishing by the year and have no right of return. What of internally displaced peoples within India, or refugees – how do they identify with this ‘universal’ entity, the state? These and other lazy generalisations tend to diminish the potential insights provided by the theorists and do not add significantly to our understanding of the military literature and the films. In her summation of Hindi war films, Viswanath writes: “Cinema thus offers the citizen a nationalist utopia.” This is undeniable, and yet, cinema also creates particular kinds of citizenship and utopic desires, implying that the citizen is not a passive recipient. Fredric Jameson’s argument (cited in Milton Bates) that “the reader of any text must identify not only its ideology but also its utopia, the specific form of collective unity it seeks to embody” would perhaps help to prise open the utopic desires and spaces that Hindi war films embody and represent. 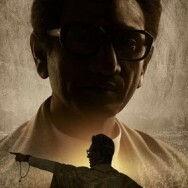 The filmic text’s negotiations with the “nation” occur in the public space and this has an impact on its construction of nation and perception of nationalism. On the other hand writing and reading are completely private activities. The imperatives of commerce do not operate in the field of military literature to the extent that they do for popular film. Arguably, commercial concerns and networks are not as valid for military literature as for war films, but to state that “writing and reading are completely private activities” is to diminish the ways in which writing and reading are also political acts which participate significantly in the construction of national imaginaries. The “Nation” in War is a necessary and ambitious project bringing together texts that can be usefully examined, contrasted and thought about analytically. What we are left with, however, is a rather imprecise and jumbled set of impressions – a somewhat disappointing outcome given the rich material at hand and the very complex political, ideological, utopic, and national terrains that these materials inhabit, create, and gesture toward. ~This article is a part of ‘The Southasian military complex’ web-exclusive package. For information on the print quarterly, click here.